The Massachusetts legislature voted June 14 to defeat the constitutional amendment that would have allowed the people of Massachusetts to cast their ballot next year and have a say on the definition of marriage. Ignoring the will of more than 170,000 people who signed the marriage petition and blocking the people from exercising their right to vote is tragic. In the Commonwealth, our state laws provide for the process whereby the citizens have a right to vote on a constitutional amendment. However, the leadership of the Democratic Party refuses to allow citizens and elected officials to vote their conscience on social issues. Their ideological positions undermine the common good. Today, the common good has been sacrificed by the extreme individualism that subordinates what is best for children, families and society. It is obvious from the unprecedented amount of pressure that was put upon elected officials that opponents of the amendment believed that the voters of the Commonwealth would have voted in favor of the traditional definition of marriage. The pressure tactics were engineered to insure that the will of the people would not prevail. The question for those elected officials who opposed allowing the marriage amendment to be voted on by the people is: do we live in a country where people are free to vote their conscience or are we controlled by what is viewed as politically correct and by powerful special interest groups? We extend our sincere appreciation to those members of the legislature who stood firm in their support to allow the people an opportunity to exercise their right to vote on the marriage amendment. Perhaps in the future legislators will have the courage to let the people vote on an issue so important to the future of families. 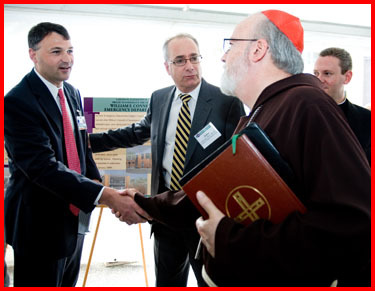 Recently, I attended a couple of leadership receptions for the Annual Appeal. 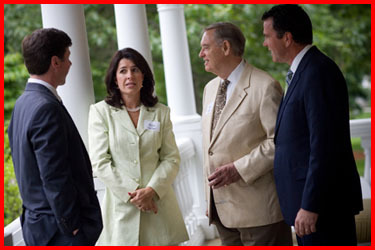 Last week, one was held in Winchester at the home of Craig and Nancy Gibson. 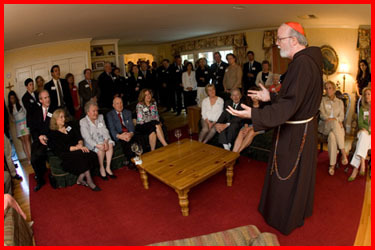 This week, we had another gathering in Hingham, at the home of Rita and Kevin Gill. 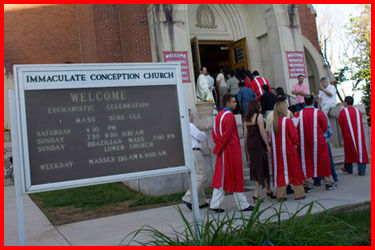 At both of these there were about 70 couples who have exhibited their commitment to their parishes and the archdiocese. 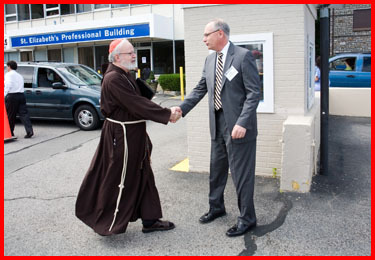 It was an opportunity to thank them for their support of the archdiocese and encourage them to continue to be supportive to the Annual Appeal. It was also an opportunity to update them about some of the activities that are taking place in the archdiocese, in particular about our bicentennial celebrations. In Winchester, Father Richard Erikson also spoke to the participants and in Hingham, Father Paul O�Brien shared his experience of establishing the Cor Unum Meal Center in Lawrence. On Saturday, I was the main celebrant for the ordination of three Jesuit priests for the New England province at St. Ignatius Church at Boston College. Of the three young men ordained, one is a psychiatrist and gerontologist named Father John R. Siberski, who is a professor at Georgetown Medical School. 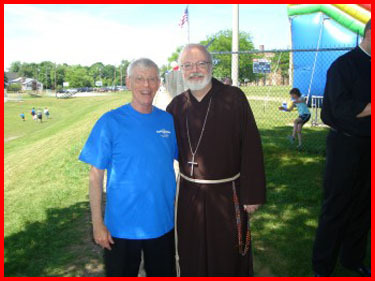 The other two men are still in their studies � Father Andrew N. Downing is going to be studying theology at Notre Dame and Father Matthew S. Monnig will serve as a pastoral associate at St. Pius X Parish in Portland, Maine. Here I am with the Jesuit provincial, Father Thomas Regan Father Downing, Father Siberski, Father Monnig and Father Richard A. Deshaies, the assistant for formation. By the way, they added a new sanctuary to the church. It looks beautiful � a lovely wooden floor with a big cross on it that gives a lot more room in the sanctuary for ceremonies, in particular for ordinations! I am always pleased when the ordinands select today�s readings from Isaiah: �The Spirit of the Lord God is upon me because the Lord has anointed me to preach good tidings to the poor, He has sent me to bind up the broken-hearted, to proclaim the liberty to captives. Jesus Himself selected this same test for his first sermon, which unfortunately ended in disaster. I find great comfort in this because my first sermon ended in disasters. I was to preach for the first time in a prison in Pennsylvania. I was quite nervous and sought guidance in my books on homiletics in the monastery library. The book said, �Speak into the horizons of your audience.� I had an inspiration. I decided to talk on the theme of great escapes in the Bible � Daniel in the Lion�s Den, the 3 lads in the fiery furnace, St. Peter in chains, Paul escaping over the walls of Damascus in a lasher. I had their wrap attention. The disaster came that night when six prisoners escaped, no doubt wafted up by my ecclesiastical oratory. They almost threw Jesus over the cliff at Nazareth after His first sermon. I felt as though something untold was going to be done to me, and that my first sermon would be my last. It was not my last sermon nor my most memorable. A few years later, I was preaching at the St. Matthew�s Cathedral on the Argentine Independence Day during the so-called dirty war. A General in a spiffy white uniform seated next to the ambassador took exception to my preaching�(I was quoting a Papal Document on human rights)�shouted something unpleasant and the entire congregation stampeded out of the Cathedral. I was having visions of my next assignment in Papua New Guinea. Cardinal Baum was so concerned that he left instructions that when Father Sean was going to preach, be sure to take up the collection before the Gospel. Know that the Good News will sometimes get you in trouble as you strive to teach the challenging truths of the Gospel in season and out of season. In the second lesson Paul says, �Now then we are ambassadors for Christ. The accent has to be on Christ. It is not about us. We are His messengers. He is the message �His Gospel, His Church. 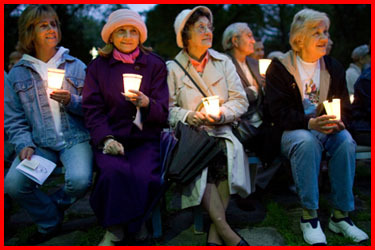 In the past, the Catholic Church was often persecuted for what we taught about God, Trinity, Virgin Birth, Hypostatic Union, today those who attack the Church do so for what we teach about the dignity of the human person, the Gospel of Life, the sacredness of Marriage, which is the sanctuary of life, the importance of real freedom based on truth, the origin and destiny of man. As Jesuit priests, you will have a unique opportunity to present a new apologetic of the new evangelization to a world that is increasingly individualistic, cynical and secularized. Your witness of a holy life will be an important part of the task of inviting people to discover Christ in the Catholic Church. Christ is the Bridegroom, never the widower. He does not exist separate from the Church. And like John the Baptist, like the Apostles, you are called to be friends of the Bridegroom �who will lead others to the wedding feast. The fact that Jesus selected this same passage from Isaiah for his inaugural sermon sets the theme that continues throughout Luke�s Gospel � Jesus as the Servant, the suffering servant who has come to serve and not to be served, who neither breaks the bent reed nor extinguishes the smoldering wick. The poor are the protagonists of the Gospel. The Suffering Servant is close to those who are poor, marginalized, sick, and forgotten. When Jesus cites this passage about �the release of captives� this can also refer to Jesus� ministry of reconciliation, the forgiveness of sins. Recovery of sight to the blind refers to Jesus� healing power but also to His teaching role that helps people to understand revelation and to see by the light of faith. It is as though Isaiah has written the job description for the Messiah, the Suffering Servant. Today in your ordination you become priests of the suffering servant. The more you penetrate the metaphor, the more you will understand your own vocation as priests and as victim. The love of Christ compels us as St. Paul writes in the second lesson. It puts us in mind of the dramatic scene where Jesus asks Peter�Do you love me�then feed my sheep. The priesthood is about love. 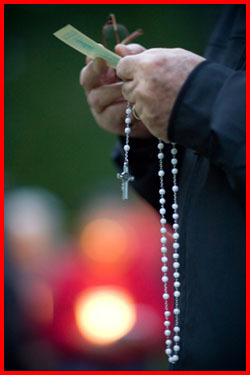 The Cure of Ars said that if we really understood the priesthood we would die not of fear but of love. The Gospel describes for us the Risen Christ, the Good Shepherd who returns to gather the scattered and to feed His sheep with the word and the sacrament. Today�s Gospel story begins with another escape. Cleopas and another disciple are overwhelmed by the seeming bad news of Jesus� death. They are fleeing from Jerusalem, from the tragedy and from the Cross. Suddenly, it is dangerous to be a friend of Jesus. Today we can say the same. We are still running from the Cross. And it is getting more dangerous to be a follower of Jesus. Cleopas and his companion are talking about Jesus, not in abstract theological constructs. They are mourning His demise. They are speaking about the hopes that they had in Jesus, and now He was gone. Or so they thought, because suddenly Jesus is walking with them, a stranger who has joined them on the way. Cleopas thinks that Jesus is the only person in Jerusalem who does not know what happened there. Actually, Jesus is the only one who really knows what has happened, that the Cross has triumphed over sin and death. They had forgotten that Jesus said while He was in Galilee, �The Son of Man must be handed over to sinners and be crucified, and rise on the third day. The third day is Easter, it is for us the Lord�s Day, the new Sabbath, the first Day of the New Creation. Jesus said: How foolish, how slow of heart to believe all the prophets spoke. Was it not necessary for the Messiah to suffer these things and thus enter into His glory? That is a phrase that must speak to you as sons of St. Ignatius. Ad majorem Dei Gloriam. In his constitutions he composed for the society. Ignatius repeats this formula 376 times. And here Jesus speaks about the glory that can come only through the Cross. The Cross of discipleship is our path to attain the greater glory of God. You are called to give greater glory, to seek ever to do more. 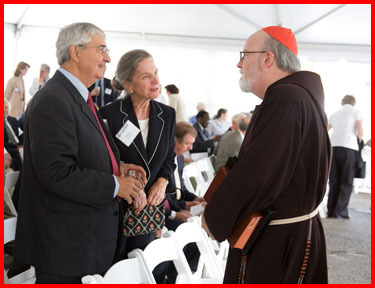 As Cardinal Avery Dulles put it speaking of the Jesuits� obligation to strive for the greater glory of God: �What we have done and are presently doing is never enough.� And this from an eminent Jesuit scholar who had authored scores of books and who has an airport names after him. The conversation closes with Jesus teaching the disciples about who He is, beginning with Moses and all the prophets. Jesus interpreted the Scripture for them. Jesus shows that all the prophets and all the scriptures referred to Him. For God nothing is improvised. And at the center of History is Jesus the Savior. And then something extraordinary happens in this Gospel. As they arrived at their destination, Jesus made as if He was continuing on and so the disciples invite Him to join them for supper�Mane nobiscum Domine�stay with us. Our God does not force Himself on us. He wants to be invited into our lives. Cardinal O�Connor often spoke of his first encounter with Mother Teresa on the day of his Episcopal ordination. Mother Teresa exhorted the new bishop, �Bishop, give God permission.� How profound! These men are inviting the Lord into their lives in an extraordinary way, like the disciples who invited the Lord to be their guest. Actually, they were His guests. He took the bread, blessed, broke it and gave it to them. And their eyes were opened and they recognized Him in the breaking of the bread, but then Jews vanished from their sight. In St. Matthew�s Cathedral in Washington at the Blessed Sacrament Chapel, there is a magnificent John DeRosen mosaic depicting the two disciples of Emmaus filled with Eucharistic amazement gazing at the tabernacle�the Lord has vanished but the bread remains, and the bread is now the Body and Blood of Christ. The story opened with the disciples, afraid and confused abandoning the community. It ends with their hastening back to the Eleven. Even before they had a chance to share their experience they are met by the proclamation: �The Lord is truly risen and has appeared to Simon.� Returning with good news they were greeting with good news. As Jesus� friends and companions, and now even more as His priests, the Eucharist is your life. His words must burn in your hearts so that you can share them with Christ�s flock. �Do you love me, feed my sheep.� You must feed God�s people with the Word and Sacrament. The more you love Jesus, the more you will be able to feed His flock. Once I was invited to preach in an old Gothic Church with a magnificent pulpit that was like a crow�s nest it was so high. I mounted the pulpit without a nose bleed, but I was shaken up to read the inscription that was on the pulpit for the priest�s eyes only�Domine, volumus Jesum videre. The words of the Greeks to Philip��Sir, we would see Jesus.� I was shaken up, because I realized it is true. The people want to see Jesus. They need to see Jesus in your pastoral love, in your ministry, your breaking open Christ�s Word, your prayerfulness, your purity, your obedience, your simplicity of life style, your love for the Church. Your priestly service will make it possible for new generations of disciples to recognize Jesus in the breaking of the bread, and to have the spiritual nourishment to return to Jerusalem, to carry on our mission to announce the Good News to a broken world. Sin and worldliness have a great centrifugal force that causes one to spin farther and farther from the Center. The Word of God and the Eucharist pull us back to God and the Church. Like the disciples nourished by the Word of God and the bread of heaven, they found the energy, the courage, the need to return to Jerusalem, to Peter to the Church. Everyone in this Church is delighted to be a part of this celebration for we know how the Lord will be able to work though you and touch so many lives. What we witness here is God�s unfailing love for us and your loving response. The back cover of the latest America magazine sports your recent vocational material. The ad pictures a trim young Jesuit priest with a full head of hair and good teeth wearing a navy blue Reebock running jersey. And the caption is, �What�s in your heart?� The telephone exchange is (212), so it is a New York number. There is nothing wrong with the America approach, but I rather prefer the Puerto Rican ad myself�there is no doubt about what is in the heart of a crucified Jesuit going over the waterfall headfirst. It is a great metaphor for our days. I would like to close quoting a Jesuit who did not go over a waterfall, but who witnessed the nuclear holocaust of Hiroshima and cared for the survivors together with his novices. I was privileged to spend a month with Father Arrupe when I was a young priest. Father Arrupe said this to his Jesuits. 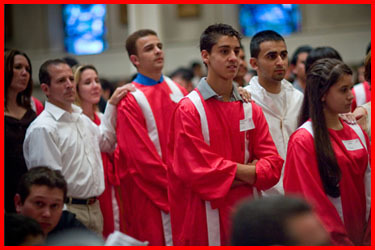 It is a great advice to a new priest who aspires to be a priest after Jesus� own hearts. May Mary, the Mother of the Good Shepherd, help you each day to fall in love anew with Christ and with the priesthood. May your hearts burn within you as you break open the Word, and may you lead others to the joy of recognizing Him the breaking of the Bread. On Sunday, I celebrated the 125th anniversary at a very vibrant parish: Holy Family Parish in Rockland. It was a wonderful celebration. Father James F. Hickey, the pastor there, has done an extraordinary job in developing the pastoral life of that community. The music, the singing and the participation is all extraordinary. 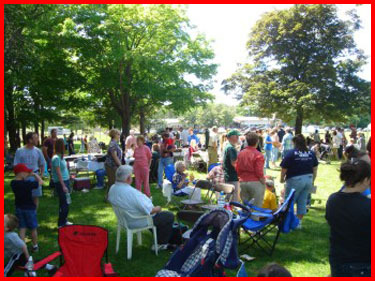 After the Mass, there was a large picnic nearby. 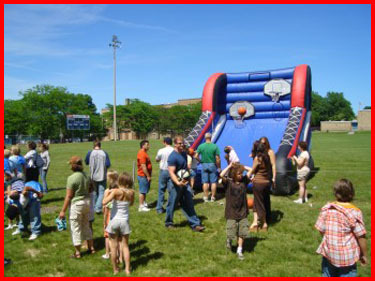 Over 1,000 parishioners attended the picnic. Later on in the day I celebrated the confirmations at Immaculate Conception Parish in Marlborough for Brazilian youth from several area parishes. 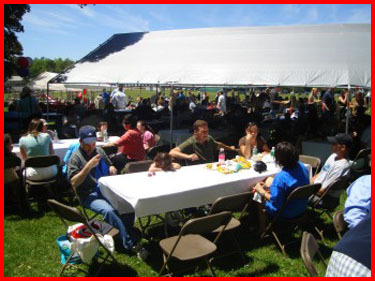 Around 70 Brazilians and Hispanics were there from Immaculate Conception, St. Michael Parish in Hudson, St. Tarcisius Parish in Framingham and Holy Family Parish in Lowell. The celebration was in Portuguese. 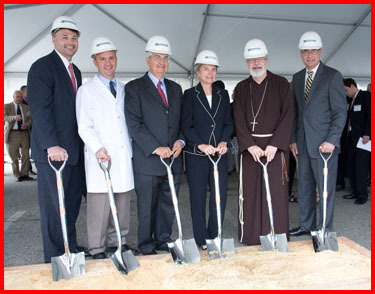 On Tuesday we had a groundbreaking for the new emergency room department at St. Elizabeth�s Hospital in Brighton. 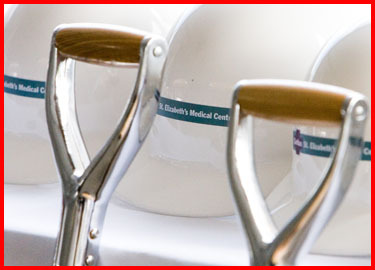 The new facilities are something the hospital community has been looking forward to for a long time and will make a huge difference in the life of the hospital and the community it serves. 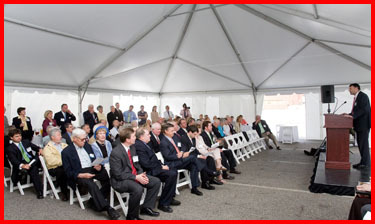 We were pleased to see a number of the important benefactors who made this all possible at the groundreaking: the Connell family � it is being named after Bill Connell � and John and Claire Bertucci. 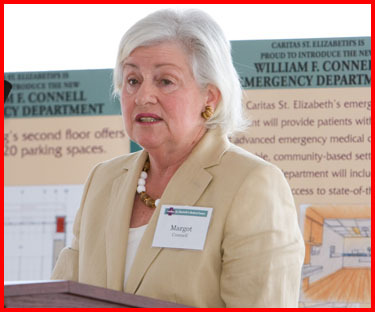 Unfortunately, Joanne McGrath was not able to be there, but she was one of the three main benefactors, together with the Connell family and the Bertucci family who was behind this project. 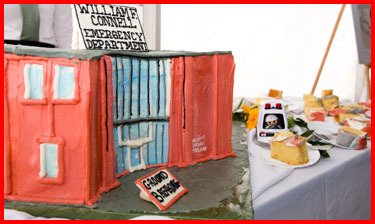 I don�t know if I�ve ever seen an emergency room shaped cake before! 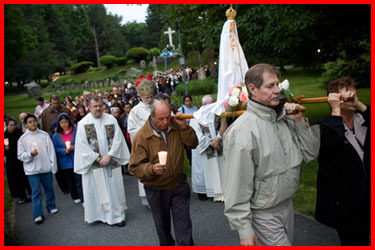 On Wednesday, I paid a visit to the Xaverian missionaries� shrine in Holliston. They are a wonderful missionary community. We are blessed that they have a shrine in our diocese. They are men helping in missions all over the world and their mission experience allows them to be of very special service to our own immigrant communities here. For example, the superior, Father Joseph, helps with the Chinese Catholic community. They also have a number of priests who speak Spanish and Portuguese. 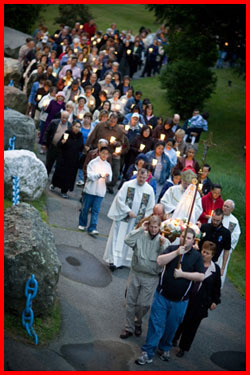 People gather for a prayer vigil the thirteen day of each month, remembering the apparition of Our Lady to the children in Fatima that the Church celebrates the thirteen of May. As a matter of fact, I�ve been to this shrine twice over the years. The first time was when I was in Fall River. I came up and celebrated a Mass with the Portuguese communities. 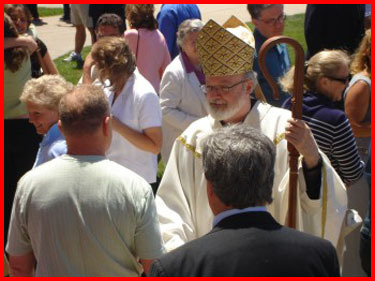 And the summer before last, I had a big outdoor Mass with the Brazilian community. The evening celebration was in English, but at the end, after the rosary, Father invited everyone to come up and pray the Hail Mary in their native language. There were people from Lebanon, Africa, India � it was all very touching. I�d say there was probably eight different languages spoken there. 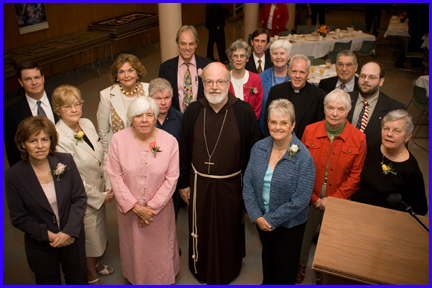 On Thursday morning, we presented awards to the archdiocesan staff who have served for 5, 10, 15, 20, 25, 30 or 35 years. Each employee was given a pin as a token of their excellent service and someone from their department said a few words about them. We are very grateful to the people who make everything work at the archdiocese and so, I have chosen as my photo of the week this group photo of the employees celebrating their anniversary of service this year. Thank you so much for the time and effort you put into this gorgeous blog. It is a treasure. I especially enjoyed your homily to the newly ordained Jesuits. I have studied and written about the Jesuits for almost two decades and I have many dear Jesuit friends, and I often feel the order — as much as I love it — needs to be reminded of St. Ignatius’ original intentions and his devotion to the Church. You did that with great skill and compassion, and then tossed in a little Pedro Arrupe for good measure. The homily was pragmatic and uplifting and I am very grateful that you shared it with us. 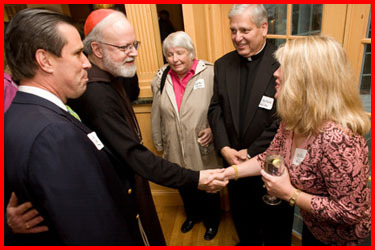 Cardinal sean, After reading this thread, I’m unsure whether to be more distressed over the fact that the MA Legislature is treating your state like Communist China (“No, the people aren’t allowed to vote”) OR the fact that people in your own diocese are so disrepectful of you & your office in their comments! I promise, if the Holy Father will transfer you to our diocese, the rhetoric won’t be that offensive. I am Catholic writing from Sri Lanka. By chance, I bounced into your site (Thank God I did) and find it very very interesting to read your posts. It is a great way to connect with the young people, and I salute your efforts in reaching the flock through such communication. I wish and pray that most Chief Shepard�s in Dioceses across globe reach out to the young flock through such mediums and with such enthusiasm. Please keep up the good work and God Bless you in all your efforts. How do you reconcile your support of marriage with the reputation the Archdiocese of Boston has for granting swift annulments to the rich and powerful (see news of the Vatican’s overturning the annulment of Joseph P. Kennedy and subsequent commentary in newspapers and online news sources)? The Massachusetts Constitution protects against the tyranny of the majority. It certainly does. So does the Catholic Church. We’re on opposite sides of the pole here, David, but one thing I do agree with you on…this is not a “let the people vote” issue. Nope. This is a moral issue, plain and simple. The Church tells us that homosexual activity is wrong. The Holy Spirit, we believe, moves the Church. I ask you to please reread your letter with the eyes and ears of those who after last week�s vote, feel a greater safety and protection for themselves, their family members and strangers they do not even know. “Safety and protection?” In this world, perhaps. But it’s a false sense of security. There’s a grave, I believe, danger in “feeling” safe and protected and actually being safe and protected. It is not the responsibility of our bishops to make sure their sheep “feel” good. It is, on the other hand, their duty to insure that they are protected from sin, and that the faithful are afforded every opportunity to share in the Eternal Kingdom of Heaven. “Letting the people vote” doesn’t cut it. Identifying, with love and compassion, sin? That comes a heck of a lot closer. I pray for your witness of the Gospel of Christ. My heart is broken by the tone of your recent letter regarding the outcome of the constitutional convention and the marriage amendment. Though I do not believe it is your intention, I believe your letter fosters spiritual degradation. It seems to imply that the constitutional process was short circuited and that legislators did not vote their consciences. Your words seem to unfairly judge members of the legislature who prayerfully and thoughtfully considered the significance of their vote in representing their constituents and the commonwealth. While we may or may not agree with a legislator’s vote, can’t we believe that many did do their head, heart and homework? The Massachusetts Constitution protects against the tyranny of the majority. 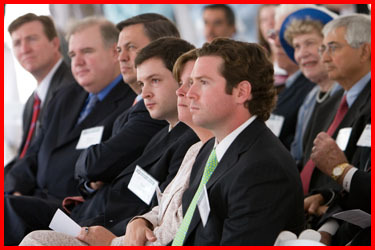 It also provides for a representative governmental process which was followed. Can we imagine if the issues of slavery, school desegregation, women’s suffrage, rights of the disabled, interracial/interreligious marriages and religious establishment had been put to a public vote of all citizens in years past? What would our society look like? Some might have preferred the continued privilege and advantage of those who were white, wealthy, able-bodied, Protestant Christian, English or male. Those of us with Catholic heritage might particularly be grateful for our constitutional process given the history of the commonwealth and country which were particularly anti-Catholic. The Holy Spirit moves in history in ways that may not be what we expect or how the majority would vote. Is it possible that the Holy Spirit is at work in this process and that God’s justice is being worked out? Are we willing to witness and support the discrimination against the protection of those who follow us? Do we want a precedent where our constitution excludes the protection of individuals and groups? As a member of a family which includes people of many faiths, races and religions including the Roman Catholic faith, I pray that we will consider carefully how our positions and words serve to unite or divide all the people of God. I ask you to please reread your letter with the eyes and ears of those who after last week’s vote, feel a greater safety and protection for themselves, their family members and strangers they do not even know. Please reconsider the effect of your letter on individuals, families, the Church and our larger community. I appreciate your prayerful listening and continued dialogue with those of us who may prayerfully disagree on this issue. Thank you again for your openness about your life and your ministry. You are truly a holy man – and a pretty neat guy! I love your opinion on the ads for the Jesuits. I agree with you and think the ad from the movie, The Mission, is closer to the truly radical call priests are called to. I think a guy in a sportshirt with good teeth with a lukewarm question is sort of like saying, this is just another option to consider, rather than the heroic nature of what the call to the priesthood is. It is time to remilitarize the knights of Malta and protect the Assyrian Catholics in Iraq. The Holy Father, both John Paul the Great and Benedict have spoken against this war, it is not their doing, but we should protect our brothers and sisters in Iraq now that it has started. While I’m glad that a variety of opinions can be posted in Cardinal Sean’s combox, I find the comments in no. 7 above to be ad hominem and disrespectful. It would be impossible to know how many thousands of lives have been blessed by Fr. Ron Coyne’s ministry over the past 34 years. 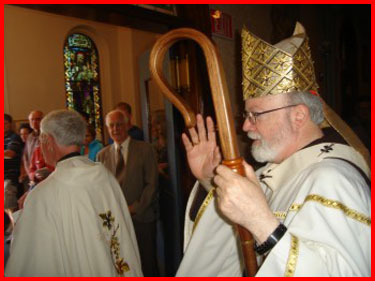 I cannot claim to be completely objective here: Ron Coyne is my ordination classmate. 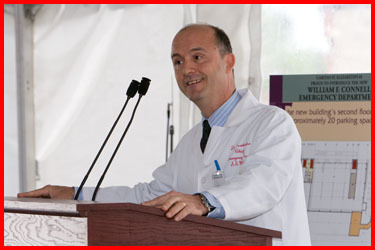 But what I may lack in objectivity is compensated for by knowledge of this man’s priestly integrity. I was so happy to read in the Pilot recently that Fr. David Shoemaker was going to preach at Fr. Blaney’s first Mass. I understand he has been out on a medical leave and am happy that he is back in ministry. We missed him and we need him and we hope he is fully recovered. Where is he assigned now? God bless you. Thank you for your comments on marriage. But, having Peter Meade on an archdiocesan advisory council makes it all the more confusing as to the importance you feel we should place on the matter. While I find your blog to be excellent each and every week, I found your homily to the new Jesuit priests to be outstanding! Truly inspirational even for a lay person. 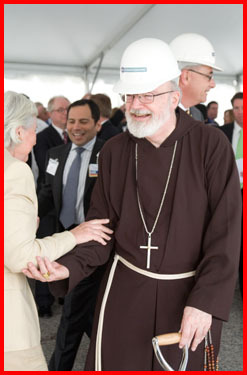 Thank you for your blog, Cardinal Sean, and I look forward to reading more from here in Wichita. I’m sorry that the marriage amendment failed this time. We’ll have to work harder next time we get an opportunity. But it’s hard to talk about integrity in a Sacrament when I read in the Pilot that Father Ron Coyne has once again been put in charge of a Parish in the diocese. How can we talk about integrity when you yourself allow someone so opposed to the Church lead a parish? His presence in my town of Weymouth has caused damage that will take generations to overcome. 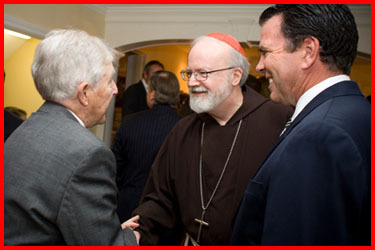 It seems that there needs to be some integrity in the decision making of the Archdiocese of Boston if we can ever have the ability to lead in other areas. 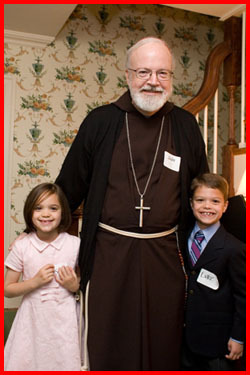 Clearly, there is a lack of thoughtfulness in whatever process brought Father Coyne back to a Parish. I find it harder and harder to take a stand when our own leadership seems afraid to run their own house. 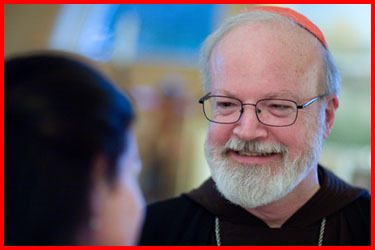 Dear Cardinal Sean, I applaud your comments on marriage. I was disturbed to see Peter Meade, who is on an archdiocesan advisory council, publish an editorial in the Boston Herald (along with his wife) that totally contradicts Catholic teaching on this essential matter. His name will be glorified. It’s heartbreaking, both for the Sanctity of Marriage and for Democracy, that a few folks would stop such a vote from happening. Whether it’s one person or a people, it’s mind-boggling, isn’t it? I guess our lives are a journey that can at times lead in unexpected directions, such can also be the case with our experiences in the Church. What is constant and unchanging in the midst of all our experiences is the presence of Jesus Christ and his promise to be with us always. I haven’t read your entire post, just the first 2 paragraphs about the gay marriage vote. I want to ask you, as a Cardinal of the Catholic Church.. why do you want the government to be involved in marriage at all? You obviously believe that marriage is a sacred institution. Shouldn’t marriage be a contract between the people being married and God? Why do you want this group of strangers called government to be a party to this contract? Why should people have to (depending on the state) pay a fee/take a class/etc to marry each other? And what if a group of gay people wanted to open “The Church of the Gays” and wanted to have a ceremony called a wedding where people exchange rings and are given a certificate showing that this gay church approves their marriage? Do you want to ban that? I support you’re right, as the Catholic Church, as a Cardinal, as a person, to not associate yourself in anyway with gay people. But I also believe that the government shouldn’t be involved in marriage in any way. Do you? If so, why?